A balanced blend of quality ingredients for active dogs and puppies in a NO grain, low carb food. Made with chicken, turkey & catfish meals. 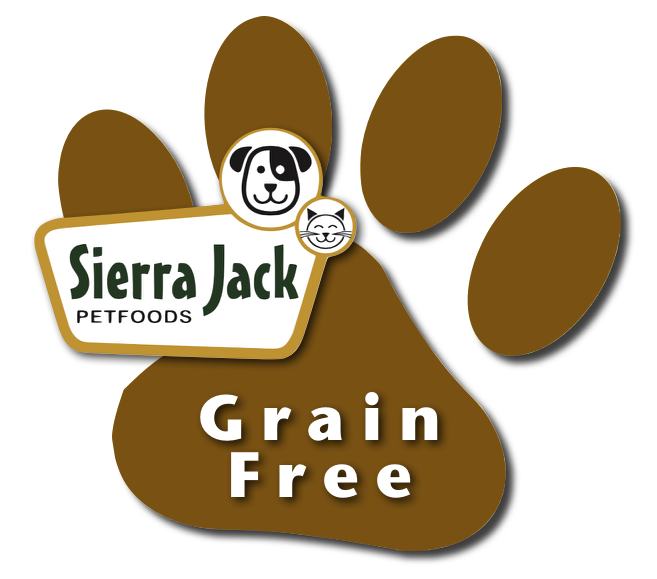 Nutritionally Complete & Balanced: Sierra Jack NO Grain dog food is formulated to meet the nutritional levels established by the AAFCO dog food nutrient profiles for All Life Stages". Chicken Meal, Potato Product, Tapioca Starch, Field Pea, Turkey Meal, Canola Oil, Catfish Meal, Carrots, Celery, Beets, Parsley, Lettuce, Watercress, Spinach, Chicken Fat (Preserved with Mixed Tocopherols), Chicken Cartilage, Natural Flavor, Lecithin, Salt, DL-Methionine, L-Lysine, Lactobacillus Acidophilus Fermentation Product Dehydrated, Cranberry, Choline Chloride, Yucca Schidigera Extract, Fructooligosaccharide (F05), Glucosamine HCL, Calcium Carbonate, Vitamin E Supplement, Mineral Oil, Ascorbic Acid, Niacin Supplement, Organic Dried Kelp, d-Calcium Pantothenate, Riboflavin Supplement, Biotin, Vitamin 1312 Supplement, Thiamine Mononitrate, Vitamin A Acetate, Pyridoxine Hydrochloride, Citric Acid, Vitamin D3 Supplement, Folic Acid, Potassium Chloride, Iron Sulfate, Zinc Sulfate, Zinc Proteinate, Iron Proteinate, Copper Sulfate, Zinc Oxide, Manganese Sulfate, Manganese Proteinate, Copper Proteinate, Manganous Oxide, Selenium, Calcium Iodate. Vitamin E Supplement, Ascorbic Acid, Vegetable Oil, Biotin, Niacin Supplement, d-Calcium Pantothenate, Vitamin A Acetate, Riboflavin Supplement, Vitamin B12 Supplement, Thiamine Mononitrate, Pyridoxine Hydrochloride, Menadione Sodium Bisulfite Complex, Citric Acid, Vitamin D3 Supplement, Folic Acid, Potassium Chloride, Ferrous Sulfate, Zinc Sulfate, Zinc Proteinate, Iron Proteinate, Zinc Oxide, Copper Sulfate, Manganese Sulfate, Manganese Proteinate, Copper Proteinate, Manganous Oxide, Sodium Selenite, Calcium Iodate. These are quantity suggestions; the amount you feed your pet can vary, depending greatly upon the breed, activity level, metabolism and your preferences. Over 100 lbs add 1/2 cup for each additional 15 lbs. of body weight. Fresh, clean water should be kept available to the dog at all times. My dog is a very finicky eater but chowed down on this food like it was her treats. If you have a finicky eater I'd give it a try. First time shoppers only, click here. Copyright Sierra Jack Petfoods. All Rights Reserved. eCommerce Software by 3dcart. Subscribe to our informative and money saving emails and we'll send you a coupon to save $10 on your next order!